This week we have a couple of mysteries involving magical cats and ghosts, and one foodie mystery-A Tale of Two Kitties: A Magical Cats Mystery by Sophie Kelly, Ghost on the Case: Bailey Ruth series by Carolyn Hart & Pudding Up With Murder: An Undercover Dish Mystery by Julia Buckley. Details at the end of this post on how to enter to win a copy of all 3 books, along with links you can use to purchase them. The past intrudes on the present in the ninth mystery featuring our favorite pair of charmingly gifted cats. When a lost cache of undelivered mail is uncovered during post office renovations, the Mayville Heights Free Public Library becomes a repository for the collection of twenty-year-old letters and photos. Librarian Kathleen Paulson takes on the mission of identifying the owners and recipients of these time capsule items, in addition to placing them in an auction benefitting the library. It’s not just the mail that is returning to Mayville after two decades, as a dire illness has Victor Janes finally ending the long estrangement from his family. Meredith Janes left her family to run off with her husband’s twin Victor, and after she was killed in a car accident brothers never spoke again. Hope for an amenable reunion is dashed when Kathleen finds Leo Janes dead, and his own son Simon becomes a possible suspect. Simon’s daughter Mia is a student intern at the library, so Kathleen can’t help but feel protective and want to help her friends. That does place her at odds with her boyfriend, Detective Marcus Gordon, but he is willing to listen to her as she investigates alternative suspects and new evidence. That some of this information comes from her two feline roommates is not something Kathleen is willing to share, as Marcus’s flexibility only goes so far. Owen’s gift at literally disappearing and Hercules’s teleportation powers are linked to the mysterious estate on Wisteria Hill, but that’s all Kathleen knows. It’s a mystery that can be left unsolved while she pursues a far more crucial one, that of whether Leo’s family, or perhaps The Family, may have had a hand in his death. Longtime readers of this series will enjoy the brief appearances of their favorite characters, especially when it looks as though Kathleen will soon need to be fitted for a bridesmaid dress. Those new to the adventures of Owen and Hercules will be quickly caught up as well, as the author skillfully reintroduces the many likable residents of Mayville Heights. Owen and Hercules are the real attraction here, of course, especially when Owen’s combative nature has him donning a veterinary cone of shame. 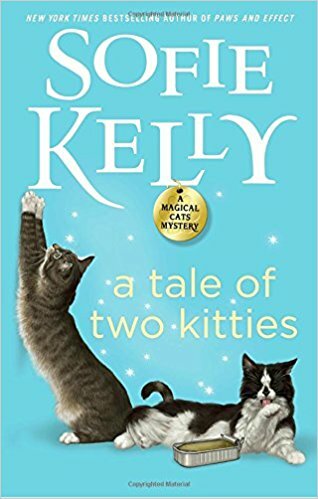 The cats’ prescience points the way and help Kathleen find justice for the man liked by all, but it’s her knowledge as a librarian that provides the final clue. There’s so much to love about this magically enhanced mystery, from its hints of gothic romance to the sharply witted dialogue. An additional short story serves as the perfect treat for cozy-loving mystery fans, guaranteeing that by the last page they will be smiling and more than satisfied. Bailey Ruth and her husband Bobby Mac died in a boating accident. Both went to Heaven where Bobby can boat and fish to his heart’s content. Bailey Ruth is an emissary which means she’s basically a ghost sent to Earth to help those in dire straits. There are rules, of course. She’s not to appear in human form unless absolutely necessary. Sometimes her version of necessary is much different than that of Wiggins who makes the assignments. As often happens, speed is of the essence, so she’s not fully informed about the problem but that’s okay, she’s good at thinking on her feet. Wiggins is more concerned about this mission than others. It looks like an impossible situation. Susan Gilbert is a sensible woman. She works for a wealthy man and keeps an eye on her flighty, artistic younger sister, Sylvie. When Bailey Ruth arrives, Susan is distraught. It seems Sylvie has been kidnapped for ransom. While Susan doesn’t have $100,000 to spare, her employer does and she knows the combination to his home safe. The kidnapper tells her the door to the office will be unlocked. Although she follows his directions, the kidnapper doesn’t call at midnight as planned. Bailey Ruth is forced to reveal herself to Susan to keep the woman calm. When Susan arrives for work the next morning, there are police cars everywhere. Her boss has been killed, the safe is empty, and she’s suspect number one. She volunteers her story to the police but more incriminating evidence is found. Sylvie shows up, safe and sound, never kidnapped, but the victim of a hoax disguised as a school project. Whenever Bailey Ruth thinks she’s found a way to prove Susan’s innocence, the killer is one step ahead of her. This is the eighth book in the series. Bailey Ruth gets better with each assignment. The police chief has seen her appear and disappear, she’s able to visit her favorite diner for a good meal or to sneak M&Ms from the chief’s desk while leaving him notes. Wiggins is even mellowing about her methods of solving problems. For a delightful, fun mystery, this one is the one to reach for. 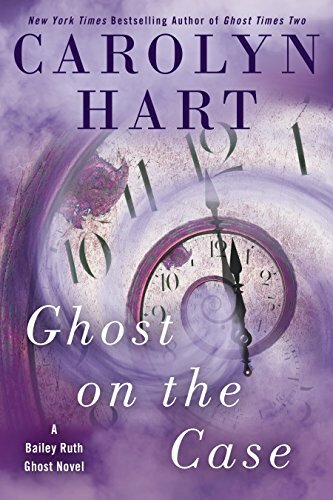 Hart also writes the Death on Demand series which has just ended with book number twenty-six. There are also three stand-alone books. Hart tells a good tale, and her books make a great To Be Read stack. Lilah Drake is accustomed to attending the exclusive parties and celebrations of Pine Haven, Illinois, but the birthday party for wealthy Marcus Cantwell is one of the few that came with an official invitation. Lilah has built up a growing business preparing special meals for clients who take all of the credit, which means that Lilah spends more time sneaking out of kitchens than entering through the front door. Ellie Parker was responsible for Lilah being an actual guest, although in truth Lilah’s adorable hound Mick was the real attraction. Retired Marcus interacts far better with canines than with humans, which may explain his having three ex-wives and a multitude of estranged children. Unfortunately, Marcus will never celebrate his next sixty-sixth birthday, as he collapses face-first into the rice pudding casserole Lilah had prepared. 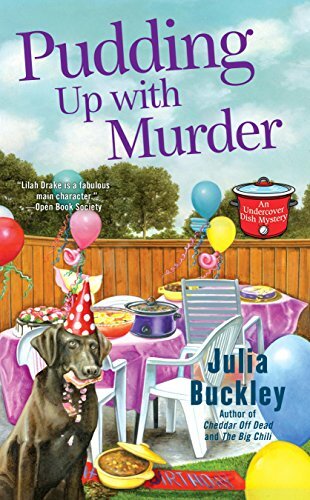 For once it wasn’t one of Lilah’s delicacies that poisoned the victim, and there are any number of exes, discontented heirs, and significant others who may have tampered with the fatal drink. Having just returned from FBI training, Lilah’s Pine Haven police detective Jay Parker asks her to coax out information that his official status often inhibits. Having grown up with Jay as a neighbor, the Cantwells give Lilah insight into a younger, less suspicious man. Jay’s emphasis on honesty nearly broke them apart when he learned about her “deceptive” practice of preparing undercover meals, and they are still in the tentative stages of romance. While jealousy and mistrust is an issue between them, love is flourishing among the many other couples in the tiny Illinois town, from those in the catering business where she works to her family, neighbors, and friends. If Lilah and Jay can move past their own personal issues, they will be a considerable investigative couple more than capable of unraveling the tangle of a truly dysfunctional family. This continues to be a warm and engaging series full of so many likable and entertaining characters. This third novel advances characters’ arcs and brings them to very satisfying points in their lives. Romance is indeed alive and flourishing in Pine Haven, and the relationship between Jay and Lilah is developed realistically by having them confront issues from their pasts. Indeed, Lilah’s ex-boyfriend and television chef Angelo Cardelini could have been an irritating or obnoxious presence in their lives, but instead he proves himself to be as delightful and well-meaning as he is often exasperating. Lilah’s empathetic canine companion Mick as well continues to patiently lend an ear to her woes, serving as a perfect wise counsel to the mystery to come. Full of humor, romance, and genuinely engaging characters, this is the perfect combination of food and intrigue. To enter to win a copy of all 3 books, simply email KRL at krlcontests@gmail[dot]com by replacing the [dot] with a period, and with the subject line “cats ghosts food,” or comment on this article. A winner will be chosen November 4, 2017. U.S. residents only. If entering via email please include your mailing address, and if via comment please include your email address. I wanna win, I wanna win, I wanna win —- they sound just great and thanks for offering to us! Would love to read all three. Thanks for the chance to win! I have read some of the books in most of these series but I haven’t tried the Buckley one. Can’t wait to read these. These sound like a hoot! Thank you for the chance to win ? Would love to win any one of them…all sound great! Great selection of books! I would really like to read all of them. Thanks for the chance. All three of them sound fun! Thanks for the opportunity to win them! They are all amazing. I can’t wait to read them. Thanks for sharing.